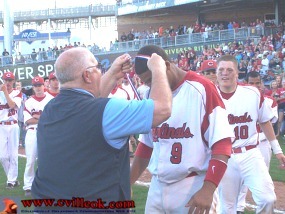 Each member of the CHS 5A State Baseball Team received a medal following the game. 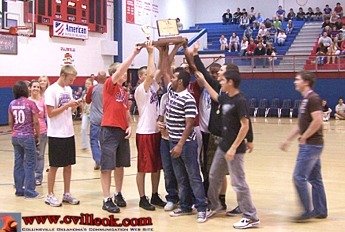 The baseball champs got to hoist the 5A State trophy before the May 18th Wheelchair Basketball Benefit game the morning after their big win in Tulsa. 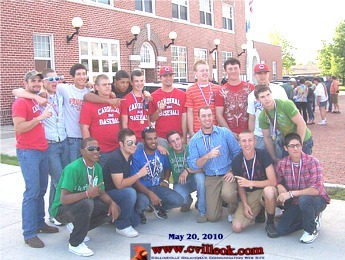 The baseball team gathered outside City Hall Thursday before going in to receive a proclamation (below) from the City declaring May 21st as "Collinsville Cardinal Baseball Day" before the City Commission meeting. 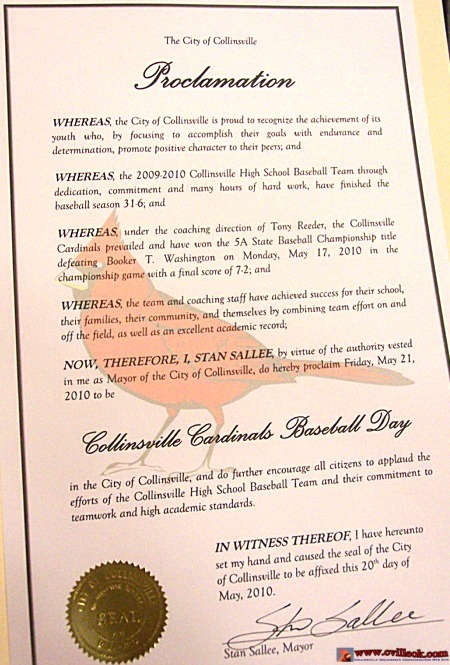 Collinsville Mayor Stan Sallee read and then presented the proclamation to Coach Tony Reeder May 20th. A large crowd of Collinsville Cardinal fans filled the first base side of the new OneOk (Tulsa Driller's) Stadium in Tulsa May 17th, 2010. This photo was taken at the start of the game. By the time the Cardinals were collecting their state trophy (following a win over Booker T. Washington) the stands were also full of Owasso and Union baseball fans gathered for the 6A title game to follow. 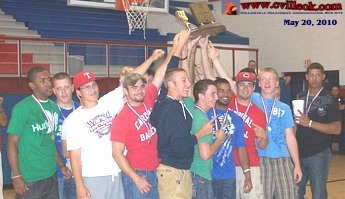 A few of the baseball champs joined the CHS cheerleaders in a dance before the May 20th assembly. 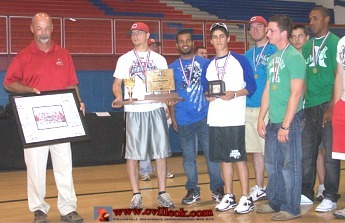 Baseball champions at May 20th CHS assembly. The CHS Baseball team and boosters presented a signed team photo along with the game ball used for the final out and the championship to Coach Reeder. Steven Chiartano's 8th place state finish in #1 singles was acknowledged at both the May 18th and May 20th CHS assemblies but he was not available for photos having just had surgery according to Jim Riley.